Overlooking the legendary Chief’s Island and bordering the Moremi Game Reserve, Gunn's Camp is one of the last few remaining luxury, vintage safari camps. Set under leafy palms and African Ebony to blend naturally with its unique surroundings, Gunn's Camp achieves a fine balance of comfort without isolating guests from the sights and sounds of the wilderness. 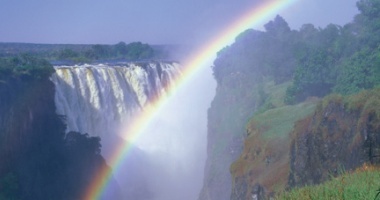 There are two camps to choose from at Gunn's - Main Camp and Moremi Crossing. The camps are priced the same and are located within minutes of each other by boat. 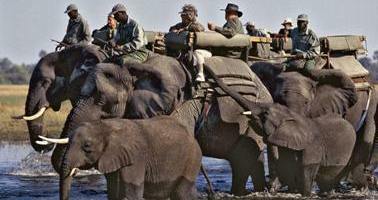 Gunn's is situated in the southern part of the renowned Okavango Delta on a tiny island called Nstwi Island. The Okavango is a vast river that never meets the sea. Instead, its clear waters spread across the Kalahari Desert, forming Africa's largest wetland. The Delta is an oasis amidst the vast plains and pans of the desert that covers most of Southern Africa. 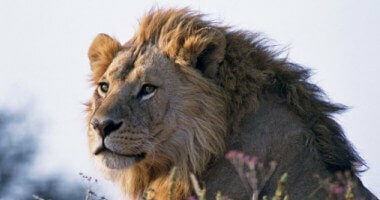 Its waterways are a collection of meandering channels, creating a haven for Africa's most notable wildlife. The flagship accommodation offering at Gunn's is Main Camp, which consists of eight fully furnished, deluxe Kenya-style Meru tents with en-suite bathrooms set on raised platforms overlooking the Delta plains. The honeymoon suite is built into one of the ancient African Ebony trees and demands unsurpassable views of the meandering waterways. The island on which the tents are located is connected to the central camp dining and lounge area by a small causeway crossing the wetlands and magically lit by a series of fairylike lanterns. Guests have access to the elevated bar, lounge and dining room, campfire boma and swimming pool. Gunn's Main Camp has re-opened after refurbishment has been completed to its characteristic split-level elevated main lodge building. The main building houses a welcoming and comfortable bar with lounge and adjoining restaurant which is renowned for its picturesque views of the water lily flowered lagoon and magnificent far-reaching vistas of the Okavango flood plains and palm fringed islands. The main lodge building, camp entrance and general fencing have been refurbished and rethatched. Become part of the bustling river life by easing between the papyrus clad banks on traditional 'mokoro' canoes. These are propelled from the stern by skilled 'poler' guides, allowing the guests to sit back and absorb the scenery. For full day trips, Gunn's Camp prepares delicious picnic lunches which can be enjoyed on a Delta island after an exhilarating bush walk. The camp managers will pack your mokoro with basic camping equipment and food so that you can set out with your own personal guide to find an island where you will set up camp. 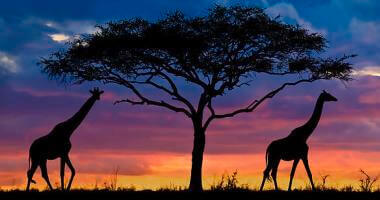 The evening will be spent preparing dinner around the campfire in the company of Africa's nocturnal wildlife. Accommodation Rates:- From $405 per person per night.